I spent all of last weekend learning about avalanches. I try to do avalanche courses whenever I'm given the opportunity, and the main thing I've learned is that avalanches are really scary. Skiing that irresistible 35 degree slope in beautiful, fresh powder is often tantamount to treading on the toes of a sleeping tiger. But as I spend most of the winter trying to harness the tiger, as it were, and since I believe knowledge is power, I try to keep learning more. The course last weekend had a slightly different, if more morbid angle. What to do if you and/or your friend(s) get caught in an avalanche situation. How to think, what reactions to have. How to dig people out, then judge their physical state, and give them first aid. How to stay alive and keep people alive. The question I found myself asking throughout the weekend was, How would I react if this happened to me? Could I keep myself calm enough to track down a friend and dig him or her out? Would I remember everything I was supposed to get done? Could I save someones life? On Sunday we visited the avalanche rescue station at Alpe d'Huez, where a squad of specially trained police officers, some specially trained avalanche rescue dogs, and doctors wait around for avalanches to happen so they can do what they are best at. Saving people from avalanches. The day was a flood of information and stories. Although it wasn't incredibly structured, it was really cool to get an idea of how an avalanche rescue squad works, and thinks. After lunch, we went out behind the station to practice digging snow caves, shelters, and the proper technique to remove and avalanche victim from the snow. And then it happened. 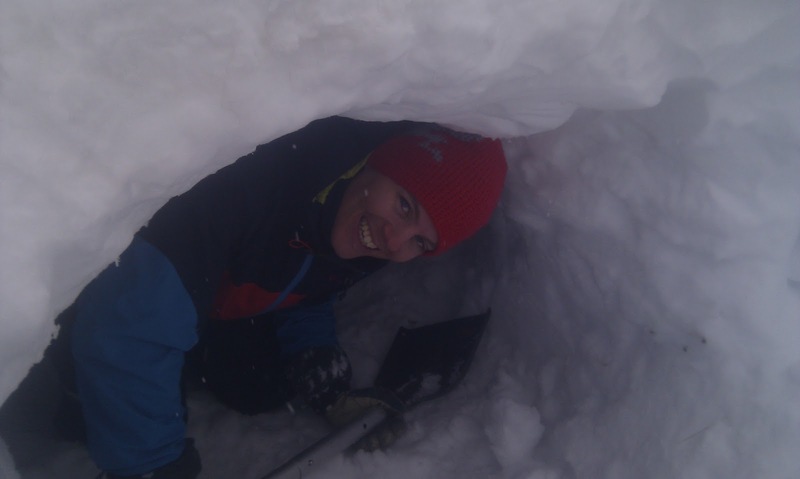 My Swedish friend Joel shows off the snow cave we're building. As Benjamin, the police officer in charge of our visit, was instructing a group of diggers, someone called his name from inside the station. Within 3 seconds he had straightened up, slid down the side of the snowbank he was standing on, and ran instead the station. A half a minute later he ran back out. "There's been an avalanche. I have to go." All of a sudden, the station was a flurry of action. Everyone was grabbing their gear and tensing for action. 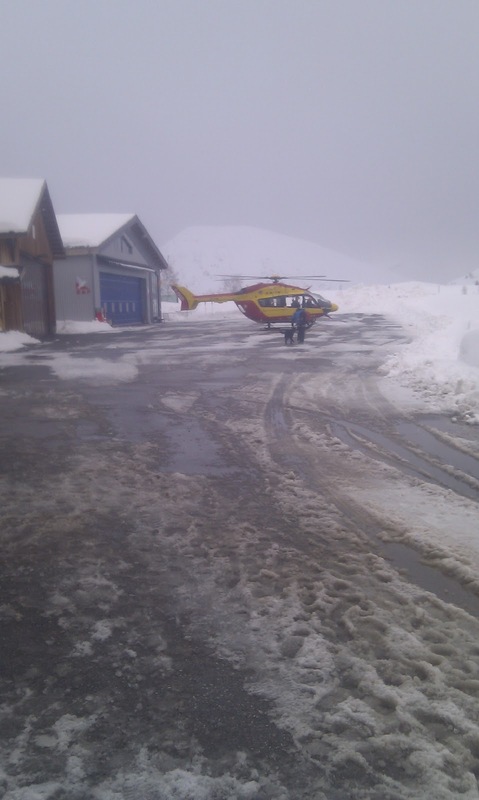 As our group of 20 or so students looked on timidly, no less than 3 helicopter loads of rescuers, including two dogs, were flown out to the site of the avalanche almost immediately. Luckily, the avalanche had happened quite close to the station, about 5 minutes helicopter flight away. Rescuer + dog get ready to get in the helicopter. 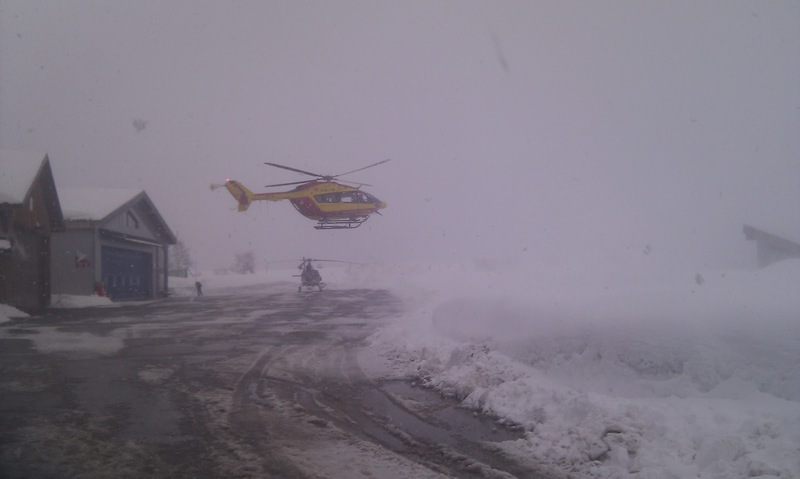 I don't know if you've ever been near a helicopter lifting off in snow, but it gets pretty dramatic. The helicopter blades make a droning chop-chop noise, and as they rotate faster and faster, a wall of snow is blown in every direction. It may happened to hit you full in the face if you happened to be looking on, seeping down through the neck of your jacket. If you didn't happen to turn around and/or close the neck of your jacket and pull up your hood. Which would be the obvious course of action. Watching all those rescuers leave the station got me really excited. All I could think was that I wanted to help, but then I realized the best way for me to help was to stay of the way. Sigh. A couple of hours later, all the rescuers, as well as Benjamin, had arrived back at the station. He didn't even look like he had broken a sweat. "Two buried, one was under the snow for 15 minutes, but wasn't in bad shape. The other was only buried to his waist and was able to dig himself out. One broken leg." he stated matter-of-factually. 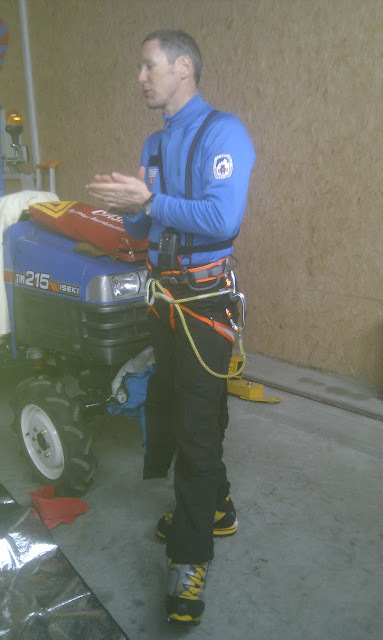 And continued to teach us about first-aid on avalanche victims. So heroes now-a-days don't wear capes and Lycra. They wear avalanche transceivers and LaSportiva high-altitude climbing boots. They stay calm in one of the most stressful situations I can imagine. They are sometimes lowered down to the site of the avalanche on 90-meter cables (true story. The helicopter pilot told us this). Which is kind of superhero-like if you ask me.